The retail industry enjoyed another extremely good year in FY2017. There are now 79 companies with sales of ¥250 billion or more, including franchise operators and holding companies, and overall sales grew by 4.5%, ahead of the 1.9% growth in retail sales overall. 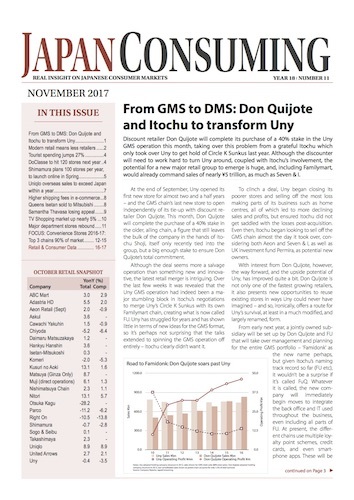 This month’s focus provides a comprehensive summary of the major developments, focusing on the two key trends of e-commerce and greater group concentration, with an analysis of each of the major format sectors in the ranking. Rizap is an opportunistic business, starting out in health foods and gyms, and then acquiring its way to a significant share of the fashion and lifestyle business. If its forecasts are right, by the end of this year it will have increased sales 10-fold in five years, while also extracting value from chains like Jeansmatethat had lain dormant for decades, all the while exploiting the growing convergence of the fashion and sports markets through a manufacturing-to-retail business. Forecasting mega jumps in sales seems to be a trend among e-commerce malls at the moment, and Magaseek refuses to be left out, despite producing the slowest rate of growth among all the leading malls in the last five years. Its biggest hope is mobile fashion thanks to a big push from parent NTT Docomo. Facing stagnation, the three big convenience store chains continue to dream up yet more new ideas designed to drive footfall, including new hybrid formats, encroaching on drugstore and supermarket territory, and even bookstores. In Familymart’scase, the shift is being driven by parent Itochu as it strengthens its control of the CVS chain. There are more wealthy households in Japan today than in 2012, but the latest generation of ‘new rich’ are less inclined to spend for status. Whereas in the 1980s newly wealthy households spent wildly on flamboyant brands to display their wealth, today their successors are more inclined to buy top quality for practical reasons, with no aversion to simple, high quality, but low price alternatives where available. The shift demonstrates a maturity in the market as a whole. Tenant sales at leading shopping centres recovered well in 2017 after a tough 2016. While accessories, sports and eateries did as well as expected, apparel also had a much better year compared to the tough trading in 2016, and the station/fashion buildings that moved to a more premium position outperformed the sector. Nippon Access is one of two huge Itochu owned food wholesale firms,and has made its fortune in no small part through supplying Seven Eleven. Now that Itochu’s own convenience store chain, Familymart, has become a powerhouse in its own right, Access may well move more of its business across to the in-house retailer and to provide a base for Itochu dominance in food distribution. Japanese consumers love to shop online and prefer to use apps on smartphones to make purchases, with Japan leading the world in mobile transactions. In the past yearthis tendency has strengthened further, with customers shopping more while commuting, offering a clear time window for promotions. Japan’s jewellery retailers have had a dreary decade, forced to slash stores and brands in order to stop the flow of red ink, There is some optimism now, though, as the sales fall looks to have bottomed-out and profitability has greatly improved. The only real growth last year came from Milk, an SPA retailer with a clear target and strong brand focus, showing what the market demands. Like other SC developers, Mitsui Real Estate enjoyed a strong 2017, and is optimistic about the next three years, with plans for several 50,000 sqm plus malls in the pipeline. After five years of lacklusterexperiments, Lawson will close Lawson Fresh from August, switching its focus to the successor service, Lawson Fresh Pick, which launched in February. The move follows a similar shift by Seven Eleven last month and leaves Familymart the only chain not leveraging its large store network to sell food online – yet.